Shannon Zirbel, a graduate student at Brigham Young University who helped work on the project, unfolds one of the solar panel arrays. A centuries-old Japanese tradition is the inspiration behind some new NASA technology. Solar panel arrays that fold and unfold like origami could be headed to space. Brian Trease, a mechanical engineer at NASA's Jet Propulsion Laboratory in California, studied origami during a high school study abroad trip in Japan, and now he's applying the same techniques to space-bound solar arrays. Trease, researchers from Brigham Young University and origami expert Robert Lang have created working prototypes of the origami solar panels. Trease and the team created an origami-like fold that can transform an 82-foot (25 meter) solar panel into a much more manageable 8.9-foot (2.7 m) diameter. The working tabletop prototype of the device is one twentieth of that size and unfolds to a diameter of 4.1 feet (1.25 m). The working prototype of the design unfolds to a 4.1-foot (1.25 meter) diameter. The design behind the solar panel arrays is much more complicated than a paper crane. Paper is so thin that regular origami techniques do not need to account for much additional thickness with each fold. However, solar panels are made with much more bulky material than paper, so Trease and the team had to creatively rework some of the traditional folds. "You have to rethink a lot of that design in order to accommodate the thickness that starts to accumulate with each bend," Trease said in the same statement. The prototype uses a combination of several folds and resembles a blooming flower when it unfolds. Existing solar panels collapse like accordions or fold up like hand fans, but Trease thinks the more intricate origami folds could simplify the folding and unfolding process. The origami technique the team used for the prototype allows the panel to open and close with a single push or pull on the corner. Koryo Miura, the astrophysicist who the Miura origami fold is named for, first worked on solar panels with origami designs in 1995. Now that astronomers are pushing for smaller satellites loaded with larger equipment, the space-saving tech may become more useful. "The fact that we're going both bigger and smaller may open up domains where it may be relevant again," Trease said. Trease thinks the arrays are the perfect passengers for tiny satellites called CubeSats. 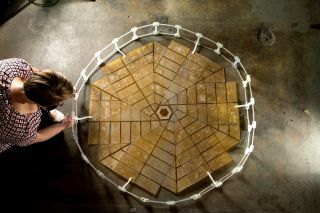 NASA engineer Brian Trease holds the prototype of the origami-inspired solar panel arrays. Some scientists think that one day solar panels could be sent into space to create orbiting power plants. The panels would soak up sun and beam back solar energy to Earth in the form of microwaves. Trease said that sending a fleet of these arrays into space would be simple if they could be folded up and packed tightly inside one rocket. The panels could then unfold themselves in space, "no astronaut assembly required," Trease added. Engineers could also use the origami technique for antenna design.